Is this a great hobby or what? No really, it is, and I can prove it. That was among my goals when I agreed to be a guest speaker at the Glen Ellyn Lions Club. Public speaking isn’t my thing; I’d rather write than talk. But what appealed to me most, besides a free dinner at Barone’s, was that I’d be addressing people who probably, at most, had only a passing interest in birds. Maybe, just maybe, I could get them jazzed about birds and birding by showing them what they’ve been missing. Sensing no reason to hold back, I titled my presentation “Why birding is the BEST hobby.” And you know what? The Lions ate it up. I started by explaining that birding is a bigger deal than they might realize. Every year, an estimated 85 million Americans enjoy feeding, observing or photographing wild birds. Only one hobby, gardening, has more fans. Birding’s popularity is due in part to its simplicity, I told the Lions. Getting started is easy. All you really need is a decent pair of binoculars, available for as little as $125. I used to say that the other must-have is a field guide to help identify the birds. Books are still an essential reference tool for most of us. But a smart phone with a birding app works fine, too, and then you have a field guide with the advantage of sound. The simplicity of birding includes being able to do it almost anywhere at any time. Once a birder, you are never really not birding. Sometimes I go weeks without a “bird walk,” but a day never goes by that I’m not watching birds. I went to a Cubs game this month, settled into my seat, and the first thing I noticed was a double-crested cormorant flying toward the lake. Need I say more? We need our hobbies to be convenient, so we have more time to pursue them. If you have a moment to peek out the kitchen window in the morning then you have time for birding. Talk about convenience: If you prefer, the birds will come to you. Just hang a feeder and set out a birdbath. This hobby is truly 24/7, inviting your daily participation at all times of the year. At home. Away from home. In the car. From the train. Through your office window. You can be a birder and never even step outside, a beautiful thing for people with age or mobility issues. And all of us can watch birds with a hot drink in our hands when the polar vortex strikes. Even darkness doesn’t stop us. At night we look and listen for owls. We could all use a little more of that, agree? Birding is a trigger, a nudge, a reason to power down and take note of our surroundings. It slows us down and sometimes stops us in our tracks. A two-minute encounter with a seldom-seen bird, when you least expect it, makes you feel lucky and blessed. I spotted a wood thrush at Cantigny earlier this month, the first I’d ever seen in the park. That bird turned an average day into a great one. I told the Lions that birds are beautiful and worthy of our attention. For this point, no words were really needed—the images on screen were quite enough. Someone in the audience asked where they can go see these birds. Central America, I replied, but if that was inconvenient then perhaps Churchill Woods, about a mile down the road. It was May, after all, and the migrating warblers and vireos and tanagers were decorating trees throughout DuPage. I talked about the challenge of birding, too. For some birders that’s a big attraction. Finding rare birds. Nailing the difficult IDs. Learning calls and songs. Growing our lists. I think any good hobby should offer challenges and opportunities to learn. Plus a few surprises now and then. Birding delivers all of these things, and sometimes all at once. At Fermilab a few weeks ago our small group encountered a young night heron. We first assumed it was a black-crowned and nearly moved on to watch other birds. But something didn’t seem right, so we began to look at the heron more closely. 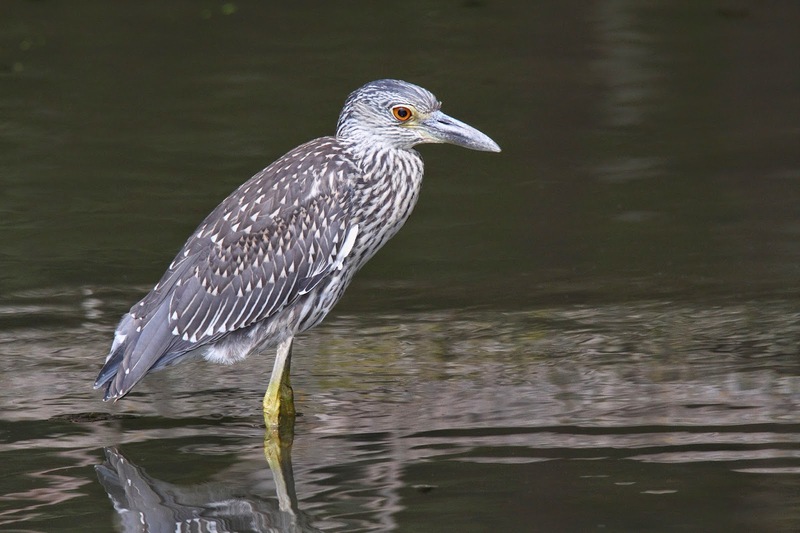 We soon worked out that it was beyond doubt a juvenile yellow-crowned night heron, an amazing find for this region. It’s nice to be with fellow birders when the unexpected happens, like that morning at Fermi. But the hobby rewards solitary birders, too, when every discovery is yours and yours alone. Birding solo is a wonderful stress reliever. Finally, I told the Lions that birding will take you places. Maybe outside on the back patio a little more often. Maybe to that forest preserve or city park you’re always driving by. The deeper you get into birding, the more you’ll want to travel. Alaska, Arizona, Florida and Texas. Belize and Costa Rica. South America. For birders, the chance to experience new species in unfamiliar habitats is irresistible. True, not all of our destinations are exotic. Like the Steve Martin character in “The Big Year,” some birders will eagerly visit the county dump if a rare bird is at stake. Or the local sewage pond. Sometimes this hobby stinks, but it’s still the best one I know.